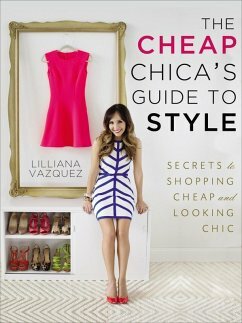 Priceless tips and tricks to shopping on a budget, from America's favorite frugal fashionista Stylish bargain-hunters have been flocking to Lilliana Vazquez's CheapChicas.com since 2008 for tips and tricks on how to shop smart, copy their favorite designer looks, and dress chic for less. Now a go-to destination for women eager for affordable fashion, the site has established Lilliana as a nationally recognized style expert. Now, in The Cheap Chica's Guide to Style, Lilliana is spilling her secrets! Fun quizzes will help readers define their style and budget. And Lilliana lays out the best places—from stores to flash-sale sites to their own closets— to score stylish deals. Approachable and beautifully designed, The Cheap Chica's Guide to Style is the must-have accessory for 2013 and beyond. Lilliana Vazquez, founder and creative director of CheapChicas.com, is one of the most sought-after style experts in the fashion industry. With regular appearances on Today, Rachael Ray, and E! News, she has become the authority on frugal fashion. This summer she'll be making over America one teen at a time on MTV's new show, Girl Get Your Mind Right.